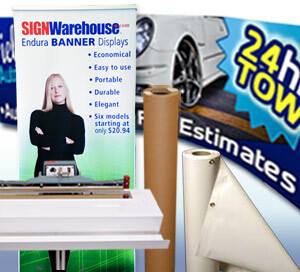 Banners produce up to 40% of the modern sign shop’s profits. Banners are big business for sign makers. It’s estimated that 40% of a sign shop’s profits come from custom made banners. So they’re not only popular but also very profitable if priced correctly. The market for banners is deep and wide. You can sell in high volume to retail stores, and in lower volume to a wide variety of secondary markets including schools, municipalities, and individuals. Learning to make, sell, and install banners correctly is an important step to becoming a profitable sign business. To smooth out the road for you, we offer this basic guide to banner making which will give you an overview of the equipment, tools and supplies needed, display options, pricing guidelines, and a few tips. Let’s start with the basic equipment list. The Qe60Plus vinyl cutter on the left and the PrismJET 49 on the right. Banners can be decorated with self adhesive vinyl or digitally printed. Whether you plot or print, you need to start with a pc and good graphic design software. The feature list in your software can make or break your designs, so limiting yourself to starter software can hurt your competitiveness. A package like LXI Master, Master Plus, CorelDRAW or Flexi-Sign will enable you to create distinctive designs that sell banners and work well for your customers. Plotters and printers: If you’re going to create vinyl decorated banners, you’ll need a commercial grade plotter with good tracking. The Vinyl EXPRESS Qe6000 is ideal because of its precision and media handling. Twenty five foot graphics are no problem on a Qe6000. Most entry level plotters are fine for small decals, but don’t cut accurately beyond 8 – 10 feet. Ask about tracking before you choose a plotter for banner making. If you prefer designing with photographic elements and gradient color, you may opt to produce your banners using a digital printer. Printing banners will also save you from having to weed vinyl graphics, a task not everyone enjoys. The plotter vs. printer decision will influence which type of banner material you use. Printers are much more expensive up front, but they also reduce material cost by imaging directly to banner rolls, which cost less per linear foot than finished banner blanks. With a little labor, and a few supplies, you can create a profitable banner. Once you’ve got your PC, software and printer or plotter, you may want to add some specialized banner making hardware. Finished banners must have sealed or hemmed edges and grommets or some other method for hanging. Since pre-finished grommeted banner blanks are readily available, these items aren’t essential. You may want to wait until you’ve made some money first. Affixing the grommets and sealing the edges can be done with these nifty devices. Grommet setter and dies. A grommet setter is a simple but rugged machine that pierces the banner material and sets the grommets used to hang the banner. Setting your own grommets does take time, but it allows you to purchase banner rolls instead of blanks which are more economical. Also, if you’re printing banners, you have to set your own grommets because you can’t feed grommeted banner material through a digital printer. There are several grades of grommet setters on the market. The Stimson and Sooper Ace seem to give our customers the best performance and ease of use. They work with the standard #2 grommets used in most banners. Grommet alternatives. Just as technology has brought us digital sign making, it has produced easy to use alternatives to grommets. 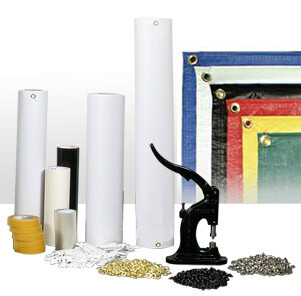 Banner eyelets can be placed on the corners of a banner blank and used just as effectively as traditional grommets. A pack of 50 can be purchased for under $34.00 which is much more economical than the cost of an old fashioned grommet setter and dies. Banner Pro. What about the edges? If you’re printing roll material to be finished as hanging banners, you’ll need to seal the edges before you set the grommets. You can use double sided banner hem tape. If you’re really committed, you can sew them yourself. But for fast, easy finishing, a Banner Pro is hard to beat. It’s an electric device with a heating element that seals the edges in a “pole pocket” style seam that’s stronger than sewn hems. At $1,295.00, it costs considerably more than a grommet setter, but if you’re making lots of custom banners, it may be a good investment. Drawing a Blank: The supplies you need will be determined in part by your equipment choices. Most signmakers start with plotters and small budgets, which necessitate buying pre-grommeted banner blanks. These come in a variety of sizes, weights and colors. Generally they are hemmed. The edges are folded over and sewn shut by the manufacturer, then grommeted in the corners for easy hanging. Modern technology has introduced heat sealed banners, like our EnduraMAX banner blanks. Like the Banner Pro, our EnduraMAX manufacturing process uses extreme heat (over 1,000oF) to molecularly fuse the banner material. The result is a stronger, more tear-resistant banner. Some people still prefer the look of the traditionally stitched banner blank and that’s okay. But if you want the most durable product, choose a heat sealed edge over a sewn one. The most frequently asked question when people venture into banner making deals with weights. What’s the difference between 10oz and 13oz banners? The number designates the actual weight of a square yard of material. So a 3’ x 3’ piece of 13oz material should weigh exactly 13oz and the same amount of 10oz material would weigh 10oz. The heavier material is generally thicker, stronger, and more durable. But nothing’s quite that simple. There are other factors that determine the outdoor durability of a banner. For more about buying the right banner material, please read our blog post of the same name. Buy the Roll: As noted above, banner blanks won’t do you much good if you’re printing. You can’t feed grommeted material through most digital printers without risking costly damage to the print head. You’ll need to order un-hemmed rolls of banner media suitable for your printer’s ink system. This can be a plus because, since the manufacturer doesn’t have to cut, seam, and grommet the material, the cost per linear foot is lower. You’ll have to do some finishing of your own after you print the image, but in the long run, it’s the most economical approach. Take care to do some basic research. If you have a solvent or ecosolvent printer, it’s easy to find suitable banner media. For users of Mutoh or Roland ecosolvent devices, our PrismJET banner product line offers great quality and value. We also have ICC Profiles to support your quest for quality. If you have a UV curable or other flatbed or roll to roll hybrid printer, don’t assume solvent printable banner media will work. Older UV printers don’t work well with flexible substrates. Newer ink technologies pose different challenges. The Mutoh Mubio flatbed roll to roll hybrid uses a corn-based ink that doesn’t adhere well to most scrim banner material, but the newer Mubio HS inks print to all standard banner media. And if you have an aqueous (dye or pigment) inkjet printer, you’ll need to purchase inkjet coated banner media, which tends to be more expensive and less resistant to UV fade. You may have to apply a liquid overlaminate such as ClearJet or Frog Juice to keep your prints from fading noticeably in the sun. 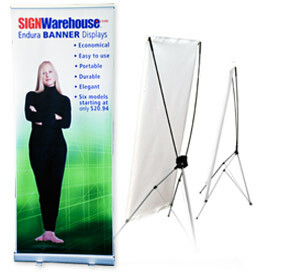 Two types of Banner Display Options: retractible roll-up and X style. Although the traditional method for displaying banners is to hang them, there are other methods you should consider. By the way, there is a right way and a wrong way to hang a banner. Use rubber rope or bungee cords whenever possible to allow some flexibility in the tension. Using rope or string with no flex simply puts too much stress in the scrim (the woven material under the surface) and causes tearing. For more about the proper hanging of your banners please refer to our “Hang em high” blog post. X Type: Hanging is the display method of choice for outdoor banners. But who says banners can only be used outside? What about using a banner to promote a sale at the WonderMall? For these indoor retail opportunities, use the newer X type and rollup banner display products. X type banner displays are ideal for grommeted banner blanks. They’re built with small, adjustable prongs that hook the grommets and keep them taut. 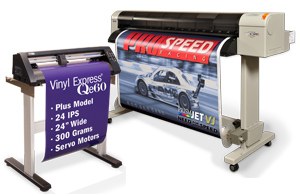 These inexpensive and simple devices expand the market for spot color vinyl banners. Think outside the box; or rather, inside the building. With good design and some X-type displays, you can sell effective banners for indoor use as well as outdoors. Roll up: For a more upscale look, try a roll up banner stand. These are great showcases for digitally printed banners. They go together like beer and pizza. You will have to trim the banner to fit. The standard width of these displays is about 32”, which is 6” narrower than the narrowest width for un-hemmed banner media. So there’s a little more finishing involved with a roll up banner. But the upside is you don’t have to hem or grommet it. Just print it, trim it, and insert it in the display. Add about 3” of bleed to the bottom. Click here for instructions. The main caveat with roll up banner displays is that the un-hemmed edges tend to curl if you use light weight scrim. Opt for a heavier scrim or “semi-rigid” material if possible. And, since these displays are often viewed at close distance, a typical scrim banner media will probably not yield satisfactory print quality. A “super smooth” product will bring out the details that will “wow” your customers. Our PrismJET 13oz double-sided banner is an excellent choice. Pricing: No beginners’ guide to banner making would be complete without price advice. As you considered getting into vinyl graphics, you may have been given the old maxim about charging 30% more than your material cost. That’s okay for basic vinyl decals, but it’s not a good method for pricing banners. The worth of a well designed banner is much more than its cost indicates. For spot color banners done with vinyl, consult the Sign Contractors Pricing Guide to get an idea of what the industry standards are. For printed banners, the industry standard is $8.00 per square foot. That doesn’t include a design fee. But shop around and find out what the prevailing rates are in your locale, as our pricing blog post suggests. Do your homework. These decisions can mean the difference between success and failure. Adhesion: The most common complaint we receive from customers venturing in banner making is about vinyl adhesion failure: that’s technical jargon for letters falling off. This is usually caused by putting the vinyl on the wrong side. When banner manufacturers prepare banner rolls and blanks, they apply a layer of PVC over the woven scrim. This process produces a banner with a smooth side ideal for the application of vinyl graphics, and not-so-smooth side. On hemmed banner blanks, it’s usually pretty obvious which is the front because the scrim is folded over and stitched on the back. Not so with a heat-sealed banner. Whether it’s sealed or sewn, always put the vinyl on the smoother of the two sides. The rougher surface on the back will not produce a strong enough bond with the vinyl’s adhesive. It seems silly, but a slight difference in surface texture can be critical. Remember that, unlike windows and aluminum panels, banners are flexible substrates. The vinyl has to cling to a surface that may be undulating like a hula dancer on speed. Expecting it to hold on to the wrong side is just too much to ask. Layout and sizes: Another common oversight for beginners is failing to account for the loss of material on hemmed banner blanks. A “two by four” hemmed banner blank is actually two inches shy of two feet wide. Take that into account in your design. Better yet, buy EnduraMAX banner blanks; so named because they’re made to give you a full finished width of two, three or four feet. Wind slits: We’ve all seen banners hung with half moon shaped slits to allow wind to pass through. The slits reduce the full force of the wind and prevent tearing right? Wrong. According to John Mahoney of Value Vinyls, cutting the scrim actually weakens it and makes failure more likely. Choose a good high denier scrim, hang it with rubber rope or bungee cords, but don’t put holes in it. Frayed edge fix: Most manufacturers of printable banner media take great care to slice rolls cleanly. Once in a while, a blade dulls before it’s noticed and a customer gets a roll with frayed edges. If that customer turns out to be you, don’t run it through your printer. Those little fibers can pick up ink from the passing print head and scatter it across the surface, ruining a print. If you don’t have time to replace it, run a match over the end of the roll and melt the stray fibers off before printing. Painted banners? Occasionally we are asked if our banners can be used in school projects and painted on by the next Andy Warhol. Most banners will not work for this application. If you need to paint on a banner, select ERC (enamel receptive coating) banner material and use enamel based paint. Having covered the basics of hardware, supplies, display option and tips, you are now better prepared to jump into the banner business and make stunning banners– and lots of money. There are a few other things you may want to know, like how to print a full bleed 4 foot wide banner on a PrismJET VJ48. Not to worry. As you may have noticed by the links mentioned above, there’s an entire section on the SignWarehouse blog devoted to banners. There you may find that special bit of insight that makes your work more effective, more profitable, or just more fun. Feel free to post comments, or questions here. Or join the SignWarehouse Community Forum, share your work and insights, and connect with other creative entrepreneurs like yourself.